How Do Propeller Deicing Boots Work? Winter is finally here, and inclement weather can present significant challenges for pilots. Experiencing icing conditions in flight can spell disaster, and ice formation on propeller blades can be particularly dangerous. When ice forms on the blades of a propeller, it decreases the amount thrust produced by the blades and creates an unbalance that increases vibration. Luckily, deicing equipment, including advanced propeller deicing boots, exist to protect your propeller against inadvertent icing encounters. Here’s a closer look at how propeller deicing boots work. Deicing boot devices were first developed in the early 1920s by the B.F. Goodrich Corporation to remove the accumulation of ice on aircraft wings. These deicing boots used a pneumatic system to inflate and deflate a rubber boot with compressed air. As the rubber expanded and contracted, the ice would crack and shed from the leading edges of the wings. Later, advanced thermal systems were developed as an effective method to prevent and remove ice accumulation on an airfoil by generating heat. Like an aircraft wing, a propeller is also an airfoil, meaning the same type of thermal deicing “boot” technology can also be applied to prevent ice accumulation on the leading edges of propeller blades. Thermal-electric deicing propeller systems use either heating wires or a layer of etched foil embedded inside rubber boots, which are attached to the inner part of the leading edge of each propeller blade. When activated by a pilot-controlled switch, the boots receive an electric current from a slip ring and brush assembly on the spinner. The electrical energy is converted to heat energy to heat the internal heating elements inside each boot and break ice from the surface of the propeller blades. Typically, a timer or cycling unit heats the blades in a sequence to ensure balanced ice removal. During preflight inspection, it’s important to check that the boots installed on each propeller blade are operational. If one boot fails to heat, it could cause unequal blade loading and propeller vibration. 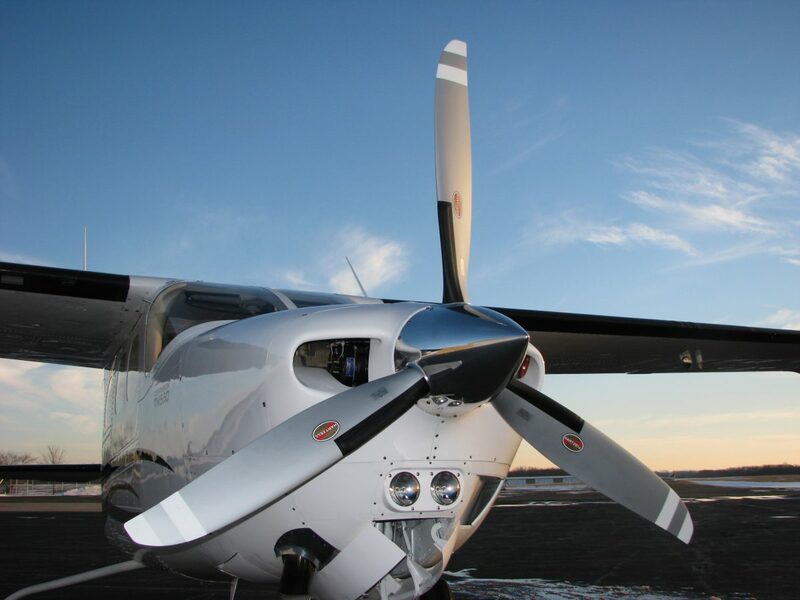 In addition to aircraft propellers, Hartzell Propeller also offers a complete line of propeller de-ice and ice protection components that are designed, extensively tested, FAA-certified, and feature superior warranty coverage. View the Hartzell Ice Protection Manuals or use our Application Guide to learn more and find the right propeller system for your aircraft or engine/airframe combination.